“This December, EXIT Theatre presents the American Premiere of a truly unusual Christmas play by Clive Barker, best-selling author and mastermind behind cult films Hellraiser and Candyman. Stuart Bousel directs Barker’s play about England’s greatest monarch, the search for meaning in a godless world, and STDs. Set in Liverpool at the end of the 20th century as the city is undergoing a massive urban revitalization movement, Paradise Street follows the romantic and philosophic misadventures of the Bonner brothers, their lovers, the local doctor, and a homeless prophet as they meet, part, love, fight, prophesy, and debunk miracles on the last Christmas Eve before their street is demolished. At midnight, the celebrated monarch Queen Elizabeth I steps through time accompanied by the famous poet Ben Jonson, her lover, his lover, and their pet ape. Why is she there and what will happen when her entourage crosses paths with the contemporary populace of England’s most infamous of port cities? 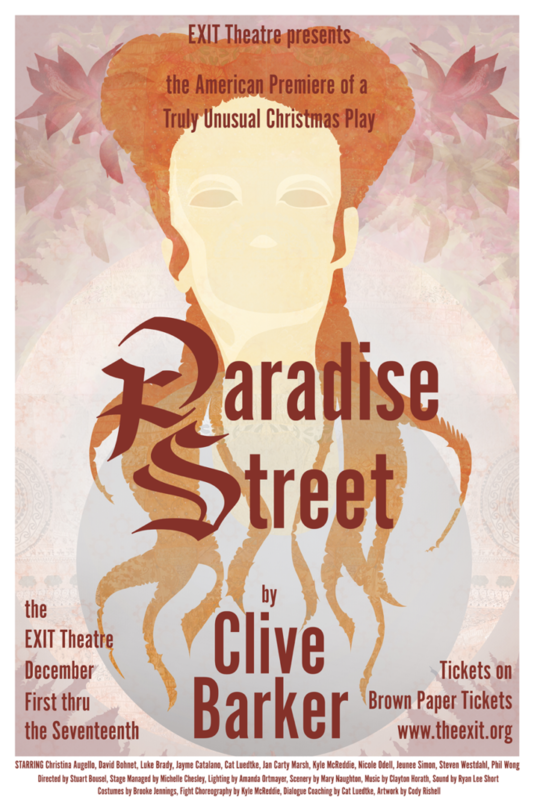 Clive Barker’s Paradise Street will open at EXIT Theatre on December 1, 2016 in a production directed by Stuart Bousel. Paradise Street features performances by David Bohnet, Kyle McReddie, Nicole Odell, Jeunee Simon, Cat Luedtke, Phil Wong, Steven Westdahl, Luke Brady, Jayme Catalano, Jan Carty Marsh, and EXIT Theatre’s Artistic Director Christina Augello in the role of Queen Elizabeth I. The production features scenic designs by Mary Naughton, lighting design by Amanda Ortmayer, costume designs by Brooke Jennings, sound design by Ryan Lee Short, and music by Clayton Horath. Performances run December 1 – December 17, 2016. Tickets are $20-$30 and on sale now through Brown Paper Tickets.